After we left Spain we had spent a short time in France. We explored the Bordeaux wine region and then some of the Provence in the southern part of the country (we will detail our time in France later because we are returning in a few weeks). From there, we drove east and into Switzerland via Geneva and immediately the beauty of the place captured us. The landscape was extremely green, the mountains in the distance had snow on them and the lakes were a light blue color we had not yet seen. It was awesome. We decided to park ourselves in Bern (Switzerland’s capital) for four days. We picked Bern because it is very central and we knew we could explore other areas of the country easily with our car. Once we arrived, we were greeted by our hosts who introduced us to our most favorite Airbnb stay yet. We had a beautiful modern two-story apartment on the outskirts of Bern that featured an amazing kitchen & dining room, a large living room with a terrace and a second level with a sunroom and yet another terrace. Furthermore, we were tucked in amongst some of the mountains that surround Bern, so the views were awesome from all sides. We took full advantage of our place so when we weren’t out exploring, we were inside enjoying our place. The city of Bern is gorgeous and sits right on a sharp bend of the Aare river, which runs down from the Alps. The river is a chalky white color due to the composition of the glacial sediment in the water. One of the highlights for us was getting a taste of Bern culture: the Aare swim. Our hosts told us in the summer the locals head down to a park on the river’s edge and take a swim. Can you imagine swimming in a river around one of the US capital cities?!?! This experience taught us a few things: #1: Swiss river water is coooooold, #2 the currents are extremely strong. We walked about a quarter mile up river to start our polar plunge and it only took us about 30 seconds to blow past the park just floating. It was a very cool experience swimming in the river with the city right there. 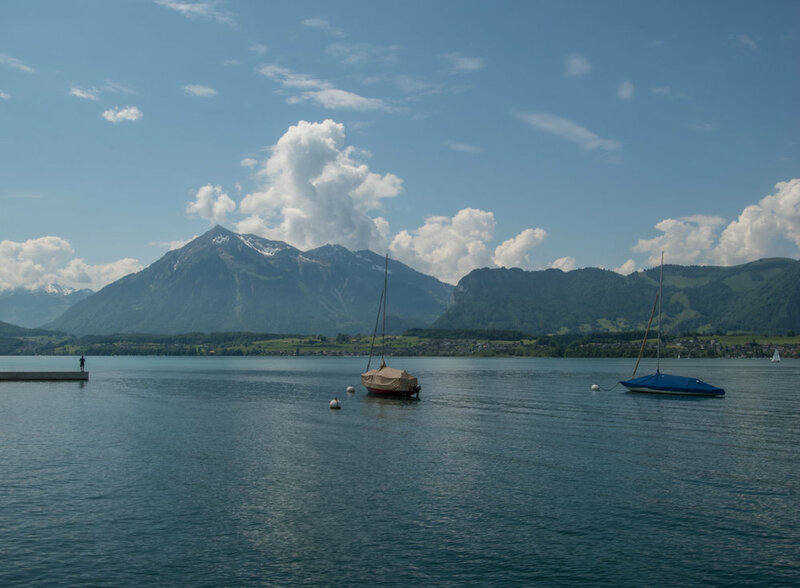 On our second day we headed up the mountains to explore Lake Thun, Lauterbrunnen, Interlaken and Lucerne. It was a full day trip but we could have easily spent weeks exploring this area. The mountain lakes are so clear blue it is insane. Of course, we had barely made it around Lake Thun and Nolan had to jump in. It is almost impossible not to. Swimming in the lake with the mountains on all sides was an experience we will never forget. After this, we headed further up the mountain to the town of Lauterbrunnen. We had seen pictures of this town, but they cannot do it justice. The small town sits in a valley that is a gorgeous green, with steep cliffs on either side. The river runs right through it and is fed by huge waterfalls on either side. Again, describing it here just cannot fully capture what it is to see it in person. We could not believe places like this exist! Moreover, the Swiss love parasailing. Up the mountains we saw at least a hundred people leaping off the steep cliff faces and gliding down to the valleys below. It was awesome! As we followed the river down we watched it feed into Lake Brienze and looped around through Lucerne before returning home for the day. Truly an epic day. Day 3 - Geneva & Chocolate? On day three we headed back towards France to explore the Lake Geneva area. Fun fact: Switzerland has four official languages – French, German, Italian and Romansh. What language you hear/see/speak depends on where you are in the country. Even the highway signs change mid-drive. As we got back to the Geneva area, we quickly realized we were back in the French part of the country. Lake Geneva is huge, blue and stunning. We ended up spending a lot of time in the town of Montreaux, which sits at the very east end of the lake. The town is beautiful with vineyards running down the cliffs all the way down to the lake. Furthermore, there are some beautiful castles sitting on the shores of the Lake such as Chillon, where we had lunch. Kirby’s favorite part of this day, however, was on our way back where we toured the Maison Cailler chocolate factory. It is one of the oldest chocolate producers in the world and is now owned by Nestle. The history of the place was pretty cool to learn about. For example, did you know the Swiss were the first to introduce milk into chocolate? We toured the factory, learned about the process and got to sample all the chocolate we could eat…again Kirby was very happy to end our day here. 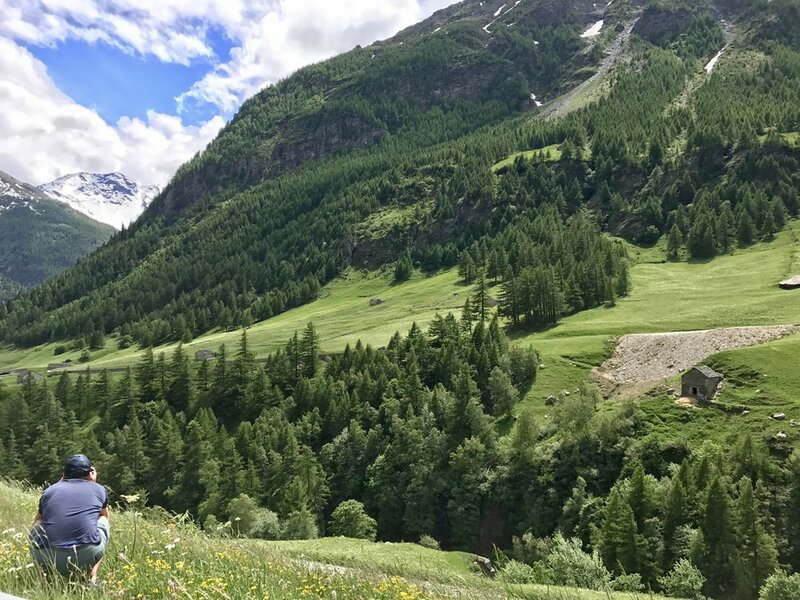 On our final day in Switzerland we decided to take a stab at seeing the famous Matterhorn. We had to drive south anyways to head towards Italy so we extended the drive to try and catch a glimpse of the famous peak. We quickly realized though that we had some things going against us: for one, the weather was not ideal. As we drove further up the mountains near the town of Zermatt the low clouds and storms blocked every possible view we would have. Secondly, we did not realize that getting to Zermatt was actually not possible by car. We had to drive to the town of Tasch, park the car, and take a train the rest of the way. Between these two challenges, we abandoned our journey and instead opted to just explore the valley below. Still amazing and some of our favorite pictures we took while in the country. From there were took the most insane, long drive through the alps down into Italy where we would start our tour of Italy for the next few weeks. The total journey included a new experience for the two of us: a car train! We literally drove onto the flatbed of a train car and sat in the car as the train traversed a steep mountain pass and an incredibly long tunnel. The drive overall took us forever, not because it was long, but because it was so stunning. We must have stopped 20 times to take pictures and take in the landscape. Waterfalls coming off the mountains, lush green valleys and snow covered mountain peaks. Just incredible! We are currently sitting in the beautiful town of Camogli after spending three amazing days in Lake Como. We have already been through Florence and Venice and are off to Rome next. We are loving Italy so far and will have plenty of pictures and experiences to share over the next two weeks before we end our time in Europe back in France.